Throughout The Bahamas Mother Nature is vividly on display above, below, and in line with the horizon. Underwater she swims in a kaleidoscope of colour. She’s seen in the fiery lines of a crawfish, the scaled skin of a red snapper, the strong shell of a green sea turtle and the rainbow colours of a parrot fish – a species whose hues marry them all. On land she’s felt in the grain of the pink sand beaches of Harbour Island and mainland Eleuthera. She’s heard in the scurry of the rock iguana and the curly-tailed lizard, an everyday visitor to our back porch. She soars above an ocean interrupted by pockets of land, riding the wings of exotic birds beautifully defined in James Bond’s book Birds of the West Indies. She’s admired at every turn, in all directions, to the far reaching compass points of The Bahamas. Although, if nudged to choose a favourite among her brush stokes, I would say it’s the scene of the sub-sea sand waves. 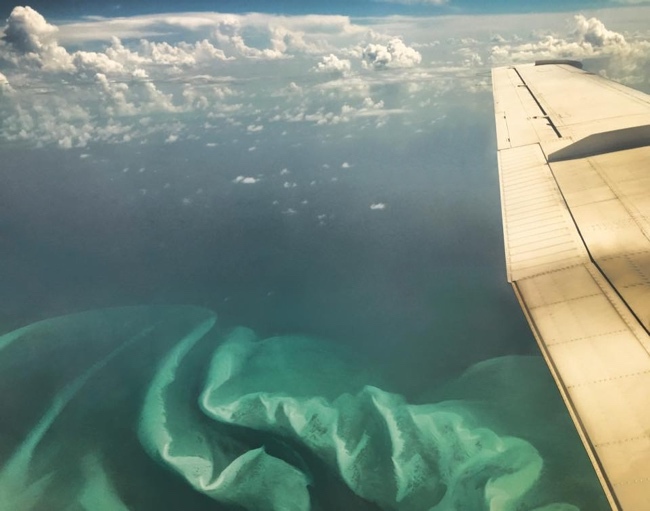 Created by strong sea bottom currents in the shallow waters that kiss the ocean depths of the Exuma Sound – a body of water reported to dramatically drop some 6,000 feet – the sand waves can only be admired when in flight, when a birds-eye view is available from a window seat.